In June 2009, I was fortunate enough to attend the Landmark Australia Tutorial. It’s a new venture launched by Wine Australia, and aspires to be the most sought-after residential wine course in the world; one that immerses the 12 lucky participants into Australia’s fine wine dimension for a spectacular week of tasting, learning and discussing. ‘The intention of the inaugural Landmark Australia Tutorial is to create a meaningful forum for international trade and media influencers to discover, discuss and debate the voice of our top Australian wines,’ explains Paul Henry of Wine Australia. He adds that, ‘The relevance of Australia’s fine wine dimension could not be more important to our industry’s fortunes than in current times.’ Henry has a good point here: it’s important that Australia gets the message out that of all the new world countries, it has the longest established and most diverse portfolio of fine wines. Australia’s success in export markets has been centred around its good value, tasty, more commercial wines. Consequently, this is the perception that many people have of Australian wine, and it’s hard then to begin to tell them that actually there’s a lot more to it than this. So what did the Tutorial entail? We began in Adelaide, with a visit to the Australian Wine Research Institute, and a mini-version of their Advanced Wine Assessment Course. Then it was off to the Barossa, where we checked into our accommodation at The Lousie, a luxury resort in Marananga, where we were to be based for the week, and where we began the series of tutorial sessions with an overview of the Landmark Australia category. Also staying with us at the Louise were the three course tutors: Michael Hill Smith, Tony Jordan and Andrew Caillard. You really couldn’t wish for a better bunch of tutors – each of them legends in their own fields and deeply knowledgeable about Australian wine. They were opinionated without being dogmatic, pitched the content of the course perfectly, and were good humoured with it. In addition to Michael, Tony and Andrew, we had a series of guest tutors presenting specific sessions (the list of these names is a roll call of the great and good of the Aussie wine industry), as well as winemakers who would join us each evening for the dinners. There were three different components to the Tutorial. In the morning, we had two sessions each focusing on specific wine styles. Then we left The Louise for a different venue each day, where we had lunch and a longer afternoon session. This relocation was inspired: if we’d stayed the whole time at The Louise, fantastic though it is we’d have felt a bit hemmed in by the end. Then we’d return to The Louise for a short down time followed by pre-dinner drinks and then dinner at the fabulous Appellation restaurant, which is part of the resort. The menu each day devised to accompany more fine wines, in the presence of two or three visiting winemakers. Overall, during the week we were exposed to 248 of Australia’s finest wines. The pace was perfect: not too few, not too many, and all the wines were presented in conditions in which we could appreciate them fully. Some were served blind; many were not. The organization, logistics and overall program were brilliantly executed. Over the coming weeks, I’ll be writing up the experience of the Tutorial. My verdict? I have always valued the notion of perspective, because our perspective determines how truly and clearly we see. While many have experienced Australia’s best wines before, few will have encountered them in this sort of context, in such a concentrated burst. 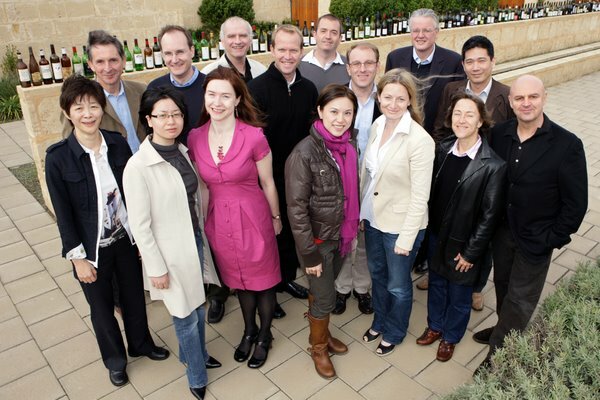 We, the fortunate 12 participants of this first Landmark Tutorial, were given a chance to gain an almost unparalleled perspective on the Australian fine wine dimension, in a brilliantly devised and near-perfectly executed course. We were able to access the distilled wisdom of some of the industry greats, while at the same time trying benchmark wines that are rarely, if ever, brought together in this way. One of the great things about the week was the chance to get to know the tutors, the lecturers, organizers Lucy Anderson and Paul Henry of Wine Australia, and—perhaps most significantly—fellow tutees. In a residential setting like this you really are in each others’ faces, so it’s important to have good group chemistry. Fortunately, the group gelled together really well. It was like a large family, and I was sad to leave when the Tutorial came to a close.